What do you think of this Construction Utensils with Construction Plate? Great idea or waste of money? Get your young construction fan these utensils and companion plate and they'll reward you with productive meal times filled with smiles! 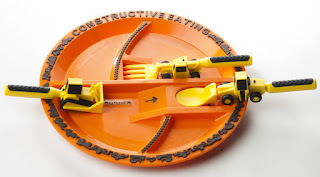 Taking the taboo away from "playing with your food", Constructive Eating has combined fun and function with its Construction Plate and Set of three Construction Utensils. Different construction machines decorate the outer rim of the award-winning Plate and internal divisions keep food "materials" separated. The patented connecting ramp and loading dock are designed to work with the Construction Utensils to help little ones push, scoop and forklift their way through a healthy meal! This combination of Plate and Utensils are perfect of going out to eat, extending productive time at the table, encouraging those not-so-favorite foods, or just for fun!